Theo Fabergé the last remaining grandson of Russian Imperial Jeweller Carl Fabergé created the ANNIVERSARY EGG to celebrate the sixty years which have passed since the creation of the modern state of Israel. Since the 1990's Theo always wanted to travel to Israel and had wanted to design an Egg for Israel. He has chosen the Menorah outside the Knesset building as the 'surprise'. In fact he had personally made a beautiful menorah in 1987 using diverse materials including gold pink ivory mammoth ivory and ebony wood. Theo chose guilloché enamel and precious metal for the ANNIVERSARY EGG, the technique made famous by his grandfather. 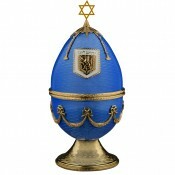 The Egg is formed in fine silver hand engine-turned and enamelled in the azure blue of the Israeli flag. The finial is the Star of David crafted in silver and 24-carat gold; from its ornamental support are suspended gilded tassels. 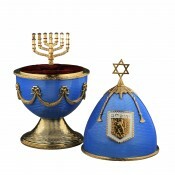 To the top of the Egg Theo Fabergé applies the Badge of Jerusalem designed by A Koren and chosen as the official symbol of the city on the first of the month of Adar 1950; the lion of Judah appears in front of the wall and an olive branch stands out in relief against the pristine white enamel. To the lower half appear the famous Fabergé swags and bows. The Egg is poised on a base of engine turned silver and gold. 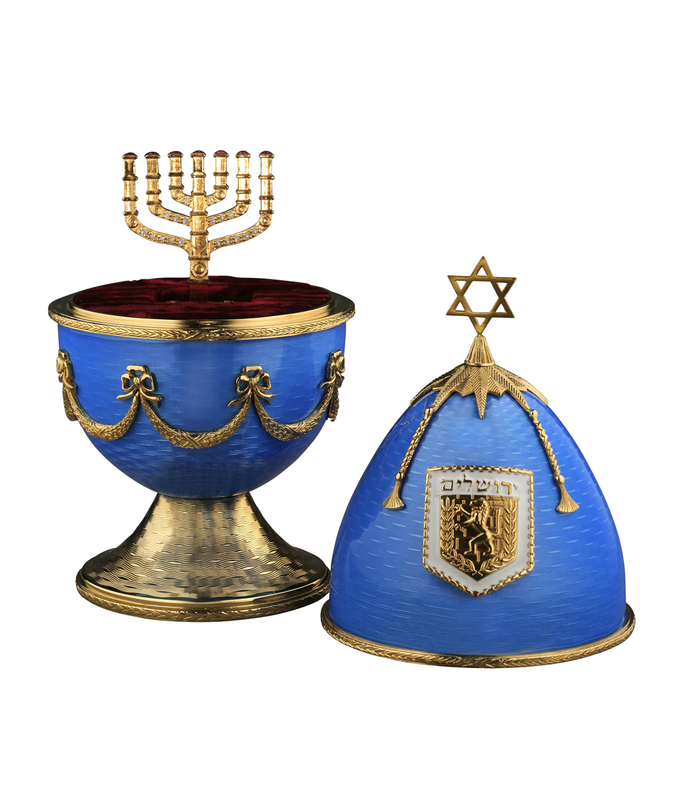 Open the Egg and in the tradition of the Fabergé family the surprise Formed in sterling silver and decorated with 24-carat gold the Menorah designed by Benno Elkan and presented by the British Parliament to stand in front of the Knesset. The Menorah is decorated with 18 brilliant-cut diamonds and is recreated in miniature detail with 7 faceted rubies representing the light of the candles. 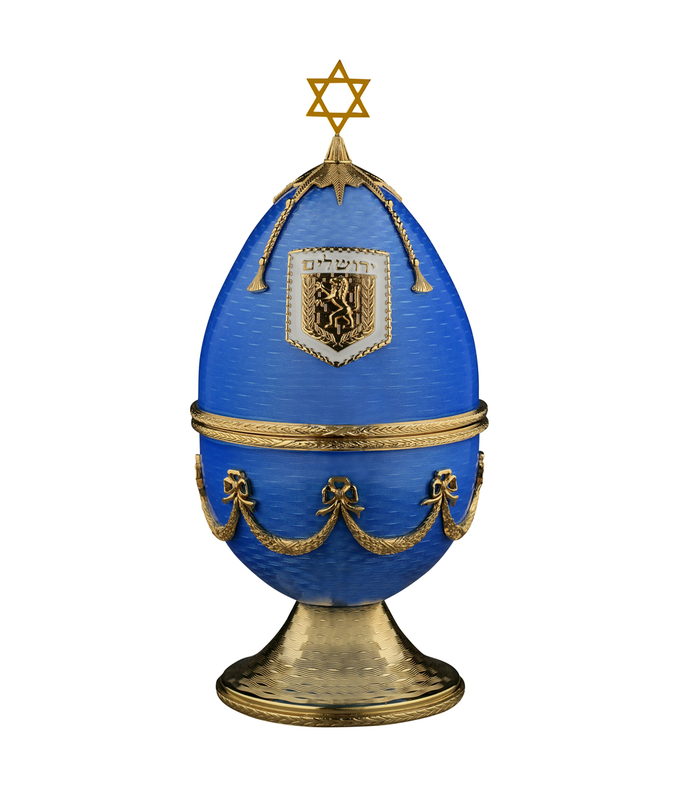 Theo Fabergé's ANNIVERSARY EGG is an eloquent testimony to the world's applause for the endurance of the State of Israel and its fine craftsmanship and exquisite design bear witness to mankind's lasting aspiration for beauty and truth. Also available as: Anniversary Desk Trophy.